Start Weighing Right Practum ® - the laboratory balance that enables you to start weighing right! Unmatched reliability attained by the Sartorius weighing technology featuring quality made in Germany. Innovative housing design and rugged weigh cell for easy weighing, whatever you weigh. Outstanding connectivity without the need for any additional software. Practum® - the laboratory balance that enables you to start weighing right! 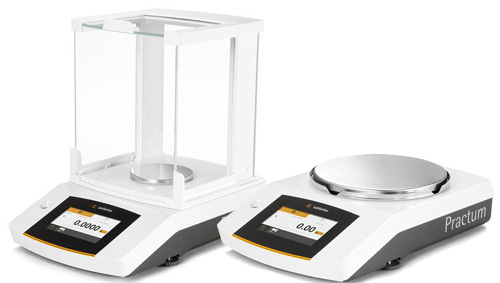 Unmatched reliability attained by the Sartorius weighing technology featuring quality made in Germany. Innovative housing design and rugged weigh cell for easy weighing, whatever you weigh. Outstanding connectivity without the need for any additional software. Just connect the balance to your computer and transfer your data directly to a Microsoft® Excel spreadsheet, for example. If you need to print your results, the laboratory balance’s automatic detection of the Sartorius standard printer YDP40 will make it easy. The sturdy draft shield will stand up to daily rigors, even to use by inexperienced operators. Moreover, it can be completely disassembled to conveniently clean the glass parts in a dishwasher.